Are you MADE in the CSU?
. Published on Monday, April 18, 2011 . Pizza with the Presidents, featuring University President Michael J. Ortiz and ASI President Ismael Souley, took place on Thursday, April 14 in University Quad. The event turnout was a success with students that filled up the surrounding tables to eat their free pizza and students who parked themselves under a shady tree to hear their Presidents answer their questions. 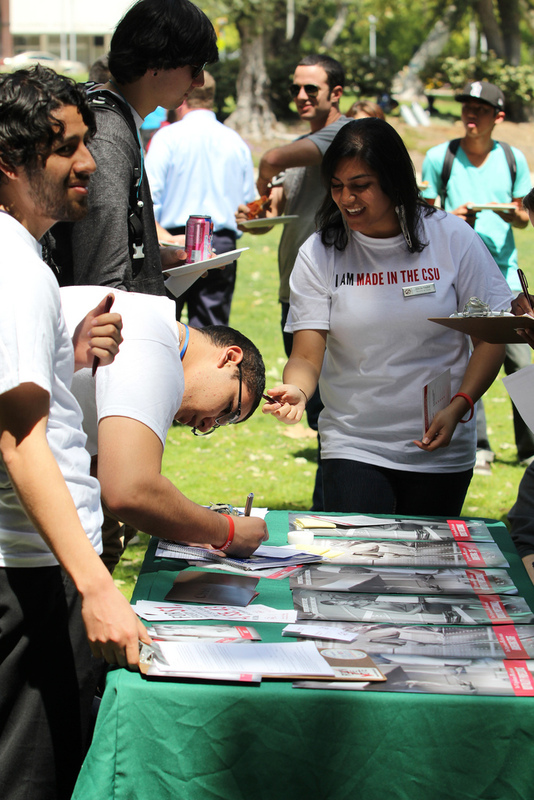 But in effort to help gain the support of students at Cal Poly Pomona, Shelly Bruce, ASI secretary of external affairs, was also in attendance at Pizza with the Presidents promoting the “Made in the CSU” campaign. Bruce, who was elected earlier this year by CSSA as the official Lobby Corps Officer for all 23 of the California State Universities, was tabling at Pizza with the Presidents by providing passersby with letters to local legislators asking for their support with issues arising in the CSU. For more information about how you can help lobby on behalf of CPP, contact Shelly Bruce at asisecexternal@csupomona.edu or (909) 869-3616.